With the strike by Verizon union members now in its fourth week – and no settlement appearing near -- frustrations born of service delays and cancelations remain primarily the bane of consumers, although business customers are also taking on collateral damage, some of which may not be visible to the untrained eye. That’s the view of David Rohde, a longtime industry watcher and senior consultant at TechCaliber in Washington D.C.
“Customers are asking their Verizon (Enterprise) account teams for, you name it – an inventory of current services, a next response to a bid for new services, a network management request that can’t otherwise be handled automatically – and the answer is coming back very frequently that those people aren’t around right now so you’re going to have to wait,” Rohde writes in a recent blog post. They aren’t around because they’re handling the workloads of some 40,000 striking union employees. And though Verizon insists publicly that its replacement workers are up to their temporary tasks, social media channels are littered with accounts of customers having to call multiple times to arrange repair or installation appointments that sometimes wind up going unmet anyway. A police department in Pennsylvania has blamed the strike for a telephone outage that lasted some two weeks. In Syracuse, N.Y., a century-old purveyor of safety shoes and supplies called Henry Frank Wholesale has been without phone or DSL Internet service for more than a week, despite multiple service visits from Verizon’s replacement roster. "This has been devastating for us," owner Tony DiBiase tells Syracuse.com. "If customers can't reach us, they'll just go somewhere else, and once you lose them, they may not come back." Verizon responded in this case that the difficulties being encountered getting DiBiase’s business back in touch with its customers are not necessarily related to the strike. The company also announced late last week that it is adding “thousands” of additional temporary workers to augment those already filling the shoes of striking union members. For enterprise customers, however, some of the negative consequences from the ongoing strike may not be as obvious as a nonfunctioning phone or missed service call, says consultant Rohde in an email to Network World. “Everything with enterprise these days is a back-and-forth with their suppliers. The strength or weakness of account teams is critical,” Rohde says. “Whether or not they have any pull in their organizations is a major variable. 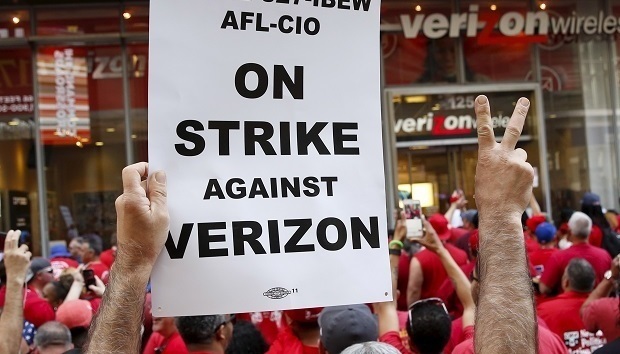 Verizon is putting on a lot of bravado in this strike but there’s much less margin for this than (during previous strikes) given the way they’ve squeezed wireline more than wireless. A request for comment from Verizon Enterprise has gone unanswered.